bl.uk > Online Gallery Home	> Online exhibitions	> Asia, Pacific and Africa Collections	> Chumba. Bazar & Temples. 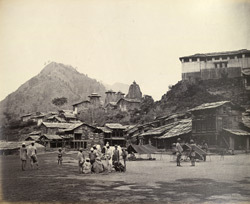 This photograph of the town of Chumba and temples was taken by Samuel Bourne in the 1860s. It forms part of an album entitled 'Photographs of India and Overland Route'. The town was founded by Raja Sahil Varman in the 10th Century and named after his favourite daughter, Champavati. Sahil Varman also built the temple here where Champavati is worshipped as a goddess. Chumba is the centre of the high pastures where the Gaddis or local shepherds bring their flocks in the summer before retreating to the Kangra valley in wintertime. It was founded by the Pahari dynasty who ruled over the area from the tenth century. The district is also one of the starting points for Yatra pilgrimage for Hindus visiting holy sites high up in the Himalaya.